The JUGS Softball Pitching Machine is the official softball machine of the ASA and USA softball teams. This superior softball pitching machine allows you to hit 11" or 12" softballs, JUGS Sting-Free softballs, JUGS Lite-Flite Softballs, and more at speeds ranging between 15 and 60 mph! It features a realistic underhand delivery with a patented always see the ball delivery system. The swivel-base design provides 360 degrees of movement to pitch fly balls, pop-ups, and ground balls. The Jugs Softball Pitching Machine throws straight balls, risers and drops for fastpitch teams, and perfect arching-tosses for slow pitch teams. The Jugs Softball Pitching Machine features a digital readout display, so you can set your machine to throw the exact mph you desire. It is portable and easy to move and set up, so you can be ready for practice anywhere you choose! 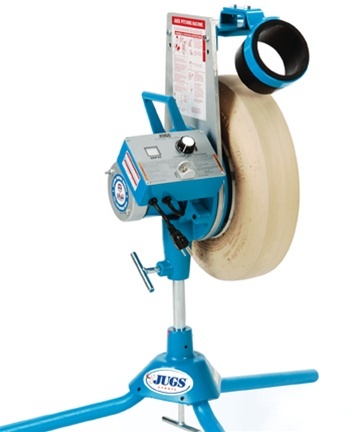 The JUGS Softball Pitching Machine is recommended for players ages 6 and up and is used by pitching machine leagues, youth leagues, and high school teams. This softball pitching machine runs on a 1/4 horsepower, 3 amp motor, powered by a 110-volt AC or 1000-watt generator. It allows for quick consistent pitching for your hitters which ultimately means more swings and more batting practice. Please Click on the Arrow (below) to see the Jugs Softball Pitching Machine in Action.